The Azores is an archipelago of volcanic peaks in the Atlantic, around 1500 km west of Lisbon, with great diving. The best time to go is from April to October. The big pelagics - beaked whales, sperm whales, fin whales, humpbacks, false killer whales, dolphins, turtles and so on are most common between May and October. Average water temperature ranges from around 23 C in summer to 16 oC in the winter. A marine reserve 3 miles from the island of Santa Maria. "Situated near the coast, but only accessible by boat, this spot has a depth of 46 mtrs. At the bottom you can see lots of sunfish and big vadigo fish. 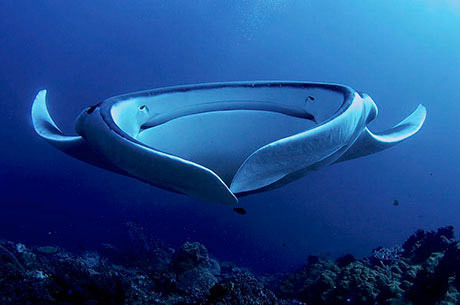 Around 20 mtrs depth usually there's a concentration of up to 30 manta rays. " Dollabarat Reef is 5 km south-southeast of the Formigas Islets on the Formigas Bank. The name comes from a ships captain who unfortunately discovered the reef when his boat was wrecked on it. The Formigas islets lie between the islands of Soo Miguel and Santa Maria. "Plateau up to 20 mtrs depth in the middle of the ocean with a huge variety of big fish, such as manta ray, athantic goliath grouper, etc... "
"Azores islands and Santa Maria Island in particular is one of the best and amazing scuba spots! " Princess Alice Bank is a seamount 83 km southwest of the island of Faial. A good place to see mobula (devil) rays and even, sometimes, hammerhead sharks. A deep dive - it starts at 35 m.
"96 km SW of Pico, Azores in the Mid-Atlantic, the largest seamount on the mid-atlantic ridge forming a cleaning station for the devil ray with up to 30 not being uncommon. " 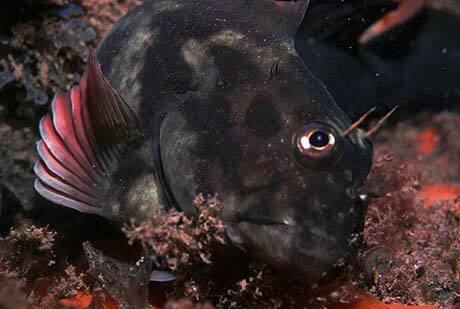 "The Azores archipelago is definitely the best spot in Europe for diving with the big stuff. The Princess Alice bank is situated 90km from Faial island, and it takes about 3 hours to get there by RIB. Descending to 35m you'll reach the peek of the underwater mountain where you'll encounter large triggerfish and perhaps some wrasses. Above you, at 2-10m depth, a large school of about 20 2.5m-wide devil rays, which you'll encounter more closely while ascending. In between the dives you'll get to snorkel with the rays, as well as spot some other large fish like wahoos. Got the chance to snorkel with dolphins on our way back to land! " This seamount is protected. You have a very good chance of seeing big stuff here: blue sharks, shortfin mako sharks, marlin and tuna. "Best shark diving destination in Europe. An hour of diving at 5m belong the boat (deep water), surrounded by 8 large Blue sharks. If you're lucky you'll also encounter a Mako shark. A dive not to miss. " "Much underwater life: whales, dolphins, sharks....Atlantic jewels "
"On a wall at 18 metres, lots of life, swim thrus "
"Deep wreck at 41 metres. love this site "
"Great dives depth ranges from 12m - 30m depending on levels and experience "
Four hundred kilometres north of Tenerife, to the west of Morocco, lies the archipelago of Madeira. It includes the islands of Madeira and Porto Santo which offer excellent diving. 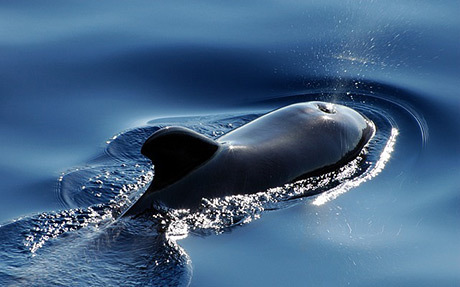 It is also a good place for whale watching with sperm and pilot whales year-long. There are several marine reserves including Garajau, created in 1986 on the southern coast of Madeira island near the town of Funchal. Madeira has a benign climate with mild winters and long summers. You can dive year-round here. The dryest time of year is between April and September. Water temperatures are highest between July and November - reaching 24oC. In March they can get as low as 16oC. A 70 m long wreck patrolled by giant grouper. Built in 1962 this cargo ship was scuttled in 2000 to create an artificial reef. In 2008 the area was designated a marine park. The wreck lies between 26 and 32 m. You need to be at least PADI Advanced or equivalent. "It's a clear water dive, Atlantic ocean Portuguese Coast near Porto Santo Island. The ship lays at 25 m top 32 m bottom. It's a sealife-fool shipwreck, sunken for a dive spot. You can find groupers, Pargos, manta rays, meros, and other variety of small fish. Promoters - Rheadive. "Artificial shipwreck sunk in 2000, with 70 m long, full of fish, including very friendly groupers. "Walls, canyon, from 20 to 30m, visibility around 30 m."
"Deep reef from 35 to 56m, lots of fish, groupers...black coral"
"Natural Reserve, full of sea life, occasionally you can trip on a seawolf, dolphins even Canejas(shark), you can touch the meros (groupers )located in the Atlantic ocean, rock/canyon/cave bottom 25 m deep maximum. "Underwater mountain situated 100 m offshore. Large groupers, barracudas and the rich biodiversity makes of this dive spot, one of the best of the island. "Volcanic rocks with walls and canyons plenty of moray eels everywhere of different species. Usually close to every moray there is a cleaner shrimp. Specially from spring to autumn it's possible to see huge sting rays." "A rock at 26 to 32 m deep full of colourful Gorgonia & Sponges holding incredible amount of very rich and diverse marine life. Is very common to find schools of White Seabass (Atractoscion nobilis, Argyrosomus hololepidotus), octopus, squids, sardines, Sunfish (Mola Mola), Congers, Crab, Lobster, etc. " "33 to 36m - A rock formation where big Congers can be found together with schools of coastal fish. " "33 to 36 m. A small cargo boat sunk several miles from the coast that holds an incredible variety of life due to the protection provided by the wreck on an sandy area. For experienced divers, good sea conditions required. " Lying at 30 meters at latitude 41.09, longitude -8.41. U Boat 1277 was scuttled by her crew in 1945. "WWII German submarine at 30 m. 67 m vessel. " "Cannons, funnels and several other historical pieces remain at a max depth of 33 m. This is an easy going wreck dive: its parts were spread in a tight circle when fishing trawlers got entangled in the wreck. No danger of entanglement, great for those who have just started wreck diving. Everything is close by within a certain radius. " "For experienced tech divers: trimix only. This large freighter was sunk in the 80's. 136m in length, its cargo of containers with cloth and wine still remain. The ship is intact with its stern at 75 m. A Dive for a few, but worth while. " With around 150 km of Atlantic coastline, the Algarve - which covers the south coast of Portugal - offers plenty of opportunity for diving. Madeira and Porto Santo are two islands in the Madeira archipelago. Azul Diving Center is located in the heart of Ponta de Sao Lourenco Marine park. It is a pretty new diving area recently discovered. Visibility in the summer can reach 50 m and you have good chance to encounter the elusive monk seal. The Azores comprises nine volcanic islands in the middle of the North Atlantic. Donates 2% of annual profit to environmental education project called Jelly Fish Project. Speak English, French, Portuguese and Spanish. Will collect you from nearby hotels and the airport. The biggest PADI dive center in Faial Island. 1 L�dia Nicolau et al (2016). Sea turtle strandings along the Portuguese mainland coast: spatio-temporal occurrence and main threats Marine Biology 163:21. Please send us your comments on Portugal. Do you want to recommend a diving centre or dive site? Let us know. If you own a dive centre get yourself added.